I first caught up with this Satanic panic drive-in classic when it was released by Dark Sky Films back in 2006 on DVD, it totally caught be surprise, a cool little slice of satanic cinema with an all-star 70's cast and directed by Robert Fuest, a wonderful director who brought us The Abominable Dr. Phibes (1971) and Dr. Phibes Rises Again (1972), not to mention the involvement of Anton Lavey, the founder of the Church of Satan! It all begins on a rainy night with Mark Preston (Star Trek's William Shatner) and his mother (Ida Lupino, The Food of the Gods) waiting for his father to return home, when he does he has no eyes and begins melting into a multi-colored glob of goo! Mark's mom is later kidnapped by a local Satanic cult led by Jonathon Corbis (Ernest Borgnine, Escape from New York)who wants a satanic tome that the Preston family has kept hidden away for years, it would grant the cult-leader favor with Beelzebub and make him all-powerful! When Mark himself becomes ensnared by the cult his younger brother Tom (Tom Skerrit, M*A*S*H) comes to his aid, along with his wife Julie (Joan Prather, Big Bad Mama) and occult expert Dr. Richards, played by Eddie Albert of TV's Green Acres. Working against the group are the local sheriff played by Keenan Wynn (Piranha) who is in tight with the Satanist, including a very young John Travolta in his first movie, though it is a small role. The satanic thrills come fast and furious in this briskly paced drive-in b-movie classic, aided by some very goopy and surprisingly grotesque special effects from Tom Burman (Invasion of the Body Snatchers) and crew, including Borgnine being transformed into a horned, goat-headed manifestation of evil, who also gets his own goopy transformation. There's also a cool scene where Shatner is rendered eyeless, the make-up effects look quite a bit like the mask from Halloween (1978) which modeled after a Shatner/Captain Kirk Star Trek mask, I thought was pretty nifty. This one has always suffered a bit from a plot that seems to evaporate a bit, I always get list, not in the complicated plot, but in the lack of a clear one, but that's never deterred me from partaking in the satanic fun, plus we get some cool atmospheric and creepy cinematography from Álex Phillips Jr. (Bring Me the Head of Alfredo Garcia). 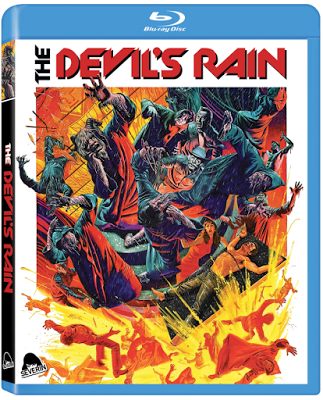 Audio/Video: The Devil's Rain (1975) arrives on Blu-ray from Severin Films, the new HD restoration (from an non-specific source) looks very nice, there's a nice but inconsistent layer of film grain, details aren't overly abundant and the image can be soft, but overall this is a nice upgrade compared to by 2006 DVD, even with a few unsightly emulsion scratches. Audio comes by way of an English language DTS-HD MA Mono 2.0 track with optional English subtitles. The audio is clean and crisp, I wouldn't say the mix was overly dynamic by any means but it does the job. Onto the extras Severin have grabbed the devil by the horns with this one, offering up a plethora of extras, beginning with a director's commentary ported over from the 2006 Dark Sky release. Then onto the new stuff, brand new interviews with the cast and crew, including an 11-min chat with Skerritt who spins a tale of how he got started in the business, originally wanting to be a director, scoring a few writing gigs and his early career, making this movie and laughing quite a bit when asked about the involvement of Anton Lavey, which he seems to find mildly amusing. FX artist Tom Burman shows up for a brief 5-min interview discussing the goopy effects created for the film and how the melting people were achieved, it's cool. Well established Script Supervisor Ana Maria Quintana (Blade Runner, Jurassic Park) speaks about landing her first job as a script supervisor on this very film by pretty much conning her way into it, and also being bilingual helped, as the film was shot in Mexico with a Mexican crew and with an English director and an American cast. The Church of Satan gets some representation on two featurettes, one with the current High Priest and High Priestess of the Church of Satan speaking about Lavey's involvement on the film, plus LaVey Biographer Blanche Barton, speaking about her relationship with the Lavey, and his time on the film with the cast. There's also a vintage '75 interview with Shatner who speaks about the possibility of a Star Trek movie opportunity, and if that was something he'd be interested in, and what that might mean for his career... he made a wise move accepting the eventual offer! Another very cool extra is an interview with director/actor Daniel Roebuck (River's Edge) who showcases his vintage horror collection while detailing his own trip to the drive-in with his mom to see The Devil's Rain, and what his mom did for him to secure a prize at the screening, fun stuff. The disc is finished up with a theatrical trailer, TV spots and a poster and still gallery. This single-disc Blu-ray release comes housed in a standard Blu-ray keepcase with sleeve of reversible artwork, which looks awesome on both sides, I believe the a-side is the original movie poster, with a cool variant on the b-side. The Devil's Rain (1975) is a fun slice of evil 70's cinema, it's not the strongest story but the performances are good and the special effects are surprisingly gooey, which is what makes this so memorable, trust me, it ain't the story! This would make a fun hail-Satan triple-feature with The Brotherhood of Satan (1971) and Race with the Devil (1975) or a fun Borgnine scenery-chewing triple play with Willard (1971) and Deadly Blessing (1981). I never really thought I needed to upgrade my old DVD of this one, but watching this Severin Blu-ray I can say that the A/V upgrade is very nice and the plentiful extras actually make the movie more enjoyable.